The term typography is also applied to the style, arrangement, and appearance of the letters, numbers, and symbols created by the process. Type design is a closely related craft, sometimes considered part of typography; most typographers do not design typefaces, and some type designers do not consider themselves typographers. Typography also may be used as a decorative device, unrelated to communication of information. Typography is the work of typesetters – also known as compositors -, typographers, graphic designers, art directors, manga artists, comic book artists, graffiti artists, and now—anyone who arranges words, letters, numbers, and symbols for publication, display, or distribution—from clerical workers and newsletter writers to anyone self-publishing materials. Until the Digital Age, typography was a specialized occupation. Digitization opened up typography to new generations of previously unrelated designers and lay users, and David Jury, head of graphic design at Colchester Institute in England, states that “typography is now something everybody does.” As the capability to create typography has become ubiquitous, the application of principles and best practices developed over generations of skilled workers and professionals has diminished. So at a time when scientific techniques can support the proven traditions (e.g. greater legibility with the use of serifs, upper and lower case, contrast, etc.) through understanding the limitations of human vision, typography often encountered may fail to achieve its principal objective, effective communication. Although typically applied to printed, published, broadcast, and reproduced materials in contemporary times, all words, letters, symbols, and numbers written alongside the earliest naturalistic drawings by humans may be called typography. 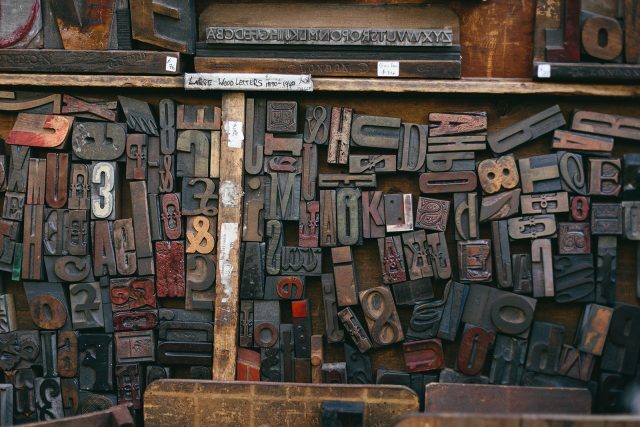 The word, typography, is derived from the Greek words τύπος typos “form” or “impression” and γράφειν graphein “to write”, traces its origins to the first punches and dies used to make seals and currency in ancient times, which ties the concept to printing. The uneven spacing of the impressions on brick stamps found in the Mesopotamian cities of Uruk and Larsa, dating from the second millennium B.C., may be evidence of type, wherein the reuse of identical characters was applied to create cuneiform text. Babylonian cylinder seals were used to create an impression on a surface by rolling the seal on wet clay. Typography also was implemented in the Phaistos Disc, an enigmatic Minoan printed item from Crete, which dates to between 1850 and 1600 B.C. It has been proposed that Roman lead pipe inscriptions were created with movable type printing, but German typographer Herbert Brekle recently dismissed this view.